We all know how important of advertisement these days. Therefore, we have come up with a list of Ads PHP Script which offers top class features and premium services at affordable cost. Few of these scripts are loaded with multi-functional admin panel, custom style settings and gives users the option to post free as well as paid ads. That’s not all, these PHP scripts allow ads creation, payment collection, responsive design, multilingual support, and compatibility with all recent browsers. So, if you want an advertisement posting website which is custom designed then lets dive into the details of these scripts. 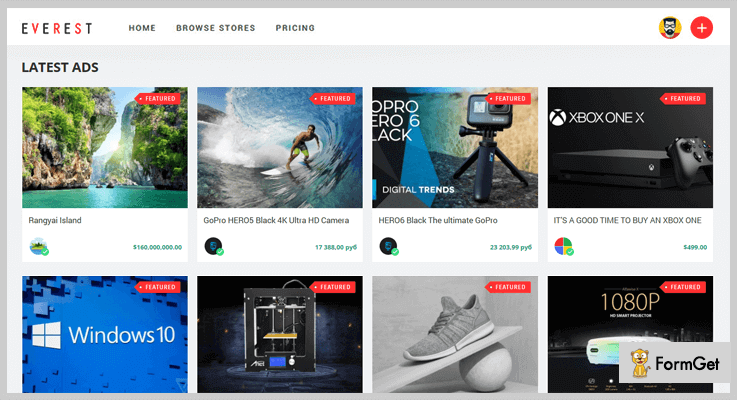 Everest is a responsive PHP Classified Ads script with which custom advertisements can be posted on a website with ease. With this PHP script, the users on your website can post different types of ads just by filling a few details. They can define the location, pricing details, terms and conditions along with other information. It supports cross-browser compatibility, 28 type of languages and offers RTL support as well. This PHP script will charge you just $30 for the regular plan that offers basic advertisement services. This script has also got an extended plan which will cost you $104 for support, updates and various advanced features. Helps you manage user review posted on various ads with details like time of review, reviewer name, rating, comment, status, etc. With this script, you send different types of notifications for ads, comments, likes, and warnings on advertisements. You can define various account and store settings for the custom appearance. Plus, it allows login through an email address or via social media platforms as well. Payments for ads can be accepted through more than 12 payment gateways like PayPal, Stripe, Paytm, Razorpay, etc. 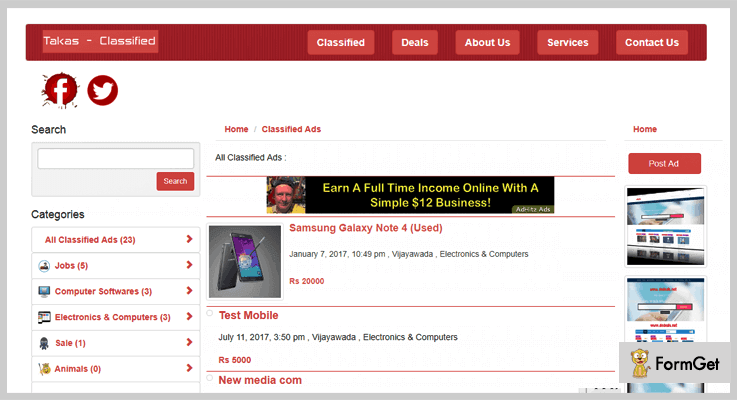 Takas Classified is another PHP script which helps you effectively create & manage classified ads as well as auctions website. It provides multiple setting options which can be automated or run manually. The script is easy to install and provides responsive bootstrap themes that look great on various devices. In addition, you can post ads with multiple images, list ads with categories and apply various profile settings. The regular license of this PHP script will cost you $20. The extended license comes with a price tag of $100 and provides updates and quality check as well. You can easily manage paid ads, banner ads, categories, user details and website information along with other advertisement essentials. Helps you handle different types of website pages like about us, services, contact us, terms & conditions and other website pages. This PHP script allows users to post ads with multiple images, provides search & filter options, categories list and more. Using this responsive script you can add unlimited ads, ads posting, users, and categories on your classified website. If you are looking for a PHP script that offers inbuilt social media login, Amazon S3, SEO tools and other customizations then you should have Themeqx Classified. This script allows users to add videos from YouTube or Vimeo platforms into their posted ads which will attract customers attention. Plus, you can post ads, blogs and website content in multiple languages. It offers two custom designed theme and allows you to switch themes with a click to give modern look to your classified website. For the basic services of the regular plan, you will have to pay $29. With the extended plan of the script, you get frequent updates, support and features all at a cost of $200. It allows users to log in through Facebook or Google ID. Plus, they can easily share posted ads on different social media platforms. With this script, offensive ads can be reported from the front-end and appropriate actions can be taken from the admin panel. This PHP script permits you to accept premium ads from the users. For such ads, payments can be collected through PayPal and Stripe. Through the admin panel, you can add, edit, or delete locations and define different type of languages as well. 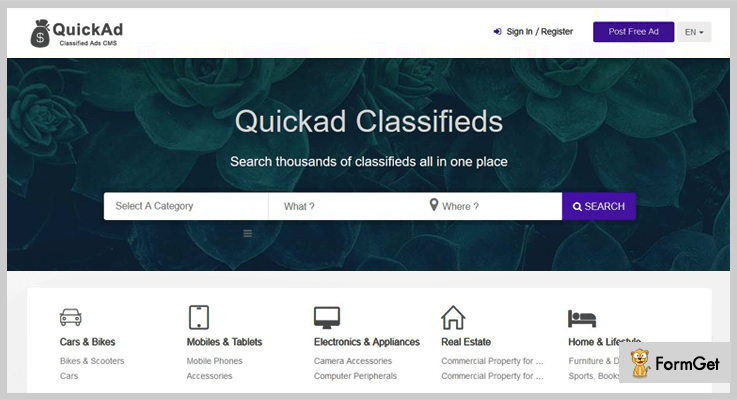 With the help of Quickad ads script, you can create a website to display classified ads, B2B ads, Buy & Sell ads, Real Estate ads, Directory LIstings, etc. 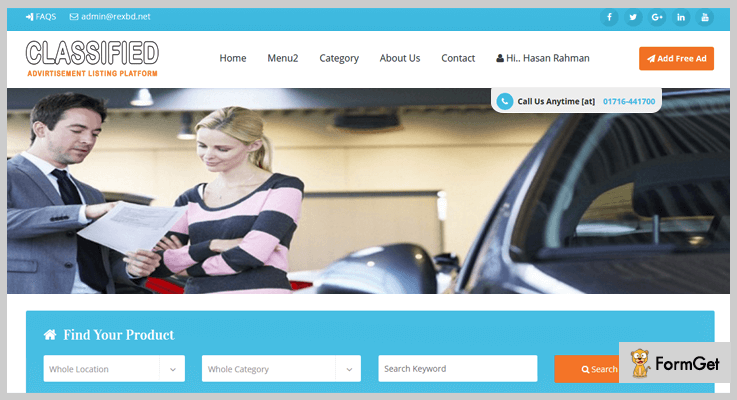 This is a premium classified ads script which is fully responsive in design, holds a powerful admin panel, and multiple ad posting facilities. It offers both front & back end customizations like color, payments, language and layout options. An amount of $59 is charged for the regular plan of this Ads PHP script. $199 will be charged if you want to use extended features for ads, enhanced services, and other facilities. With this PHP Ads script, you are allowed to create custom fields to collect required information from the users. It offers multiple theme layouts, unlimited color options, grid & list view, and supports various browsers as well as Google maps for Geolocation. With just a few clicks you can define categories and subcategories for different types of ads. You get hide & show Ads options, ads resubmission, add to favorite, and many other facilities with this script. It also provides advanced search, ReCaptcha for spam prevention, auto ads approve and email notification options as well. With CiX PHP script classified ads posting becomes an easy task. As, you can create a classified website with a few clicks, maintain registration details, generate reports, share ads on social media, and apply multiple images. Plus, this is an SEO friendly script which has a user-friendly interface and provides support for multiple currency, browsers, and other options. Regular license will cost you $31. It will include basic advertisement features, 6-month support, updates, etc. Extended license will cost you $155 for all the enhanced features and advanced services. 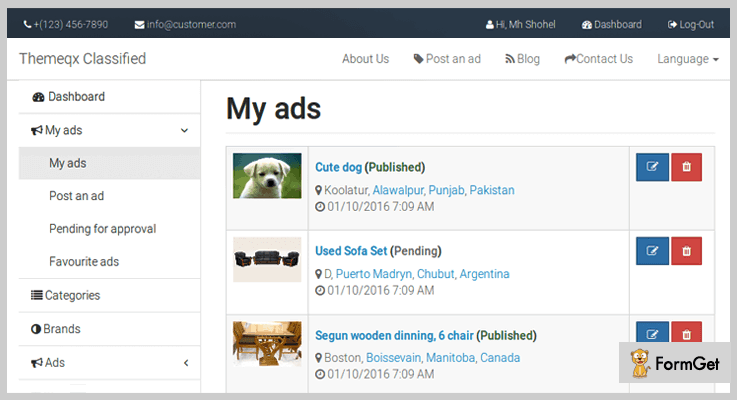 Using the admin panel you can easily manage ad posts, categories, locations, currencies, and other advertisement details. It provides a separate section for related ads, recently posted ads, and featured ads. The dashboard of this PHP script offers precise details about registered users, total ads, ads views, and the number of saved ads. You can simply manage ads with details like title, description, views, author name, date of the post, etc. Plus, you can edit, view or even delete the posted ads. So, this was all the information that we have got about the listed Advertisement PHP scripts. Now the choice is yours. Choose the one which best suited your ad website needs and try the script once. I definitely hope that this blog will help you fetch one such script which is cost effective and covers all your requirements. Still, if you have any doubt in mind then please mention them in your comments below. We will get back to you as soon as possible. Before you leave, just glide your eyes over the blogs listed below. These are few blogs which hold popular PHP scripts on top niches.